Note: Holi program was arranged by the Oriya Bhajan Group at Mangal Mandir Auditorium, 17110 New Hampshire Ave., Silverspring, MD. It was a great day for all of us who participated in the program. The organizers reached before time and made all the arrangements; but Hori utchabara mauja adina megha deri karidelare. It started raining at 3:30 pm when the Hori participants were supposed to start driving from home; and the participants reached late. The rain then stopped. It was God's wish and we had no other way but accept His wish. The starting time was still within the tolerance limit as compared to other Indian functions and house dinner parties. This is the tendency that needs to be changed, but it has historical significance with Indian traditions.
" Thy right is to work only; but never to its fruits; let not the fruit of action be thy motive, nor let thy attachment be to inaction. " Although late, the program started smoothly with much excitement and cheer and playing the colors. Many Families and singles from 5 states participated. Our international participants were Prof. and Mrs. Shrigopal Mohanty from Canada. Our last year's lesson involved the place of the function and this year we changed the place. Our this year's experience gave us opportunity to understand the people and their values. ajAgA ghA dekhi hue nAhin ki dekhAee hue nAhin (wounds in private places are difficult to see and show others). Our this year's experience is more significant and will guide us for our future activities and involvements. The rain, the distance, busy schedule, nothing had stopped families from New Jersey and Philadelphia to reach on time and participate in the Hori function. 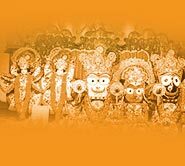 These true karmayogis are Jaigopal Mohanty and Sulochana Mohanty, Sibaprasad and Prachi Mohanty, Nitya Sundar and Twinkle Mahapatra, and Priya Ranjan and Aparna Mahapatra. The karmayogis Pramod and Liza Tripathy, and Sambit and Tanuja Dash drove on Friday night to help on Hori arrangement and food preparation. Radha-Madan Mohan brought by Naresh Das's family from Columbia, Maryland. The bimana's entered the auditorium with kirtan and playing of color. The crowd was cheerful. After all the bimana's reached the auditorium stage, Madhumita Misra and Bandita Mishra did the "Arati". Binod Nayak, Bandita Nayak joined them in singing the Arati song (Jaya Jagadisha Hare). All the program participants came near the Lords and did "bandApanA". MATA Karunamayi's two beautiful daughters who are also ISKCON devotees sang a Krishna bhajan. Bedamati Das from Florida was at the registration desk distributing the program schedule, name tags and the bhajan patrika. Madhumita Misra delivered the welcome speech. Naresh Das gave a short introduction about the function. The second part of the program was bhajan which started just after everybody finished doing "bandApanA". Children's bhajan started after that. They sang sanskrit bhajan "ohm shantakaram bhujaga shayanam", Odia hori bhajan "ki sundara aha ki Anandamaya se Radhamohana rupa" and ended with "sarbe bhabantu sukhina". The Master of Ceremony for the bhajan program was Brahmapriya Sen, who gave very nice introductions about the bhajan songs. 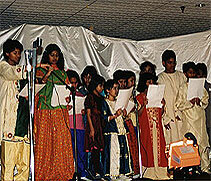 Bhajan by adults started with Deepa Parija. Deepa is a very gifted singer with melodious tone and she has the ability to sing both Odia and Hindi songs with excellent style. She sang the bhajan "keun nAma dhari dakibi tumaku". Surendra Ray accompanied her with harmonium and Naresh Das with Mrudanga. Mahasringha Dasa accompanied with jhanja. The other bhajan songs that followed are "brundabane ke banshi bajaila" by Nrusingha Mishra, sambalpuri bhajan "Hai Krushna Hai Krushna boli" by Padmanava Pradhan, hori bhajan "Dekha Dekhalo sakhi netra bhari se mohanaku" by Bigyani Das and jagannatha bhajan "Jaya Jagannatha Swami" by Surendra Ray ( Surendra Ray is a very devoted musician, a singer, harmonium player, mrudanga and tabla player). The welcome song for Hori (Aji Asichhi re Asichhi hori paraba) was presented by Deepa Parija, Sushim Dalabehera, Madhumita Misra and Bigyani Das. There was a surprise bhajan presentation by Abhinav Mahapatra. Bikash Mishra and Tannuja Tripathy (Dash) were the masters of ceremony for the cultural program. The stage management, lights and sounds were taken care of by Dhirendra Kar, and Nitya Sunder Mohapatra. The program started with Gitintya Bhakta Prahalada. The original writer of this drama is ganakabi Baisnaba Pani. Basudeva Ratha has given the "natyarupa" to this drama and the audio cassette was made with well celebrated singers and actors in Orissa. The performers were Bagmi Das (Hiranya Kashyapa), Natasha Rao (The Queen), Siddhartha Mohapatra (Narada), Satish Mishra (Indra), Mrunali Das (Brahma), Rajashri Mishra (Prahalada), Prerana Pradhan (Teacher), Shashwati Das (Gurukula student), Suman Ojha (Ghataka) and Sharmistha Mohapatra (Lord Narasingha). The children did excellent job showing their understanding far above their age level. This drama is very significant as the Holi tradition comes from this story signifying the death of Holika (Hiranya Kashyapa's sister) who tried to kill Prahalada by sitting in fire with Prahalada in her lap. The lesson from this drama proves the fact that if God wishes to save somebody, nobody could cause any harm. The costumes for the drama were designed by the parents of the performers. Sharmistha Mohapatra is also a gifted artist who designed the Narasingha costume and Narada costume for her role and her brother's role with help of her mother Sujata (Meera) Mohapatra. She also painted the pillar. If you have watched the drama, then you could have probably noticed the talents within all these children. All the children have many talents that stay hidden and they just need a medium to express it. It's our duty to provide them the medium. Shilpa Das and Shweta Das showed the act of generousity by providing food to their friends who were performing and were hungry. (Because of their involvement in their school drama they could not participate in this drama). The generousity came from within themselves and that's what we should encourage. The kathak dance by Srotalina Nayak was very beautiful. Srotalina is a very gifted dancer. The bhajan "jaya jagannatha swami" was presented by Alok Mohanty. 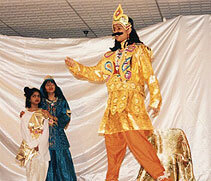 Alok is one of the child actor in the winning skit presented during 1999 OSA convention in Toronto. The drama "Jibanara Ranga" was performed by our young members of Washington Oriya community. The story was based on the real life of many computer professionals who are single. They go through so much hardships and stress in their jobs while they are also immotionally not yet settled in this country. During this transition period, the love, care and friendliness of other people in the community are greatly needed. The skit was written by Hosensu Sahoo. He was also the main director. Shrikanta Nayak's criticisms and suggestions had added many improvements to the drama. Shrikanta Nayak was the announcer for different scenes. The performers were Hosensu Sahoo, Sushim Dalabehera and Shantanu Das as computer professionals Rajesh, Ajaya and Sumit; Padmanava Pradhan as "bhai" and Lipishree Nayak as bhauja. The drama was enjoyed by all. The pala was performed by Pitamber Sarangi of New Jersey as GAHANA. Can you imagine a person who has been living in USA for more than 15 years could do a pala as gahana in which he had to remember and recite the greatest Odia literary creations without using any English words? That was our most celebrated Pitamber babu as gahana. His style, his voice, his transitions were far more superior than the palas presented even in Odisha. I personally appreciate and congratulate Pitamber babu (a Physics toper) for his excellent presentation and wish he keeps this tradition. He recited a poem in which three planets, mangala (Mars), shani (Saturn) and bruhaspati (Jupitor) were used to describe the beauty of Draupadi (Sairindhri). The planet "mangala" is red and that color is the color of Draupadi's lips. The planet "shani" is black which is the color of Draupadi's hair. The planet "bruhaspati" is fair (white) which is the color of Draupadi's body. Pitamber babu was accompanied by Durga Mishra, Naresh Das, Nrusingha Mishra and temple priest Mahashringha Dasa. The last item of the Hori function was the religious discourse by Nrushingha Chaitanyaji, the president of Baltimore ISKCON temple. Nrushingha Mishra introduced him. It was late, so he spoke to us by reducing his original planned speech. He picked up the pala Kitchaka badha and emphasized the preservance of the culture through all odds. He also told that Kitchaka died because of "kama", a weakness that could take human to their end if not controlled properly. He also mentioned about other destructive elements such as anger, ego, jealousy, greed and attachments which should be controlled. Although it's very difficult for the common human being to completely get rid of these destructive elements, they should be within control. Nrusingha Mishra gave final thanks and announced the formal end of the Hori function. The major part of the program, food, was managed by Urmila Sahu, Meera Mohapatra and Illa Ojha. They cooked the prasad for the function with the help of Pramod Tripathy and Sambit Dash in Baltimore ISKCON temple kitchen. They started their day in the kitchen and were in charge of prasad distribution. They had put tremendous effort to make everybody eat delicious food and enjoy. Mrs Urmila Sahu had prepared gulab jamun and bundi which the participants enjoyed. They had also prepared cheese cake, and bhoga items at home. The other people who contributed cooked items from home are Bandita Mishra, Sikha Sen, Bigyani Das, Chandana Pradhan, Liza Tripathy and Madhumita Misra. There was no formal dinner time. Food was plenty and people were eating all the time. Arun Ojha has made video recordings of bhajan, drama, pala and the ending. Nrusingha Mishra has made recordings of Hori melana. The still pictures were taken by Koneti Rao and Dibya Das. All of these will be compiled. Everybody participated in the clean up.